The wonderful Ian Pell has sent me a great contribution relating to Brownhills Choral Society. This is unusual for Ian, as his regular field is transport history. Ian, you’ll recall, has written lots of great articles about the railways of our area. This dovetails nicely with work David Evans and others are currently undertaking into the history of the choral tradition in Brownhills and it’s exponents. I have some stuff coming up on that at the weekend that will astound you. I thank Ian for his generosity once again. Please, if you have any memories of these events, or anything else to say for that matter, either comment here or mail me: BrownhillsBob at Googlemail dot com. Cheers. I was wondering when the Brownhills Choral Society would crop up. Interesting photograph of the front of the Co-operative Society Hall and so not to disappoint here’s a view of the interior showing the labour exchange posters and cards on the walls and some choristers appearing to be in full flow at rehearsals. 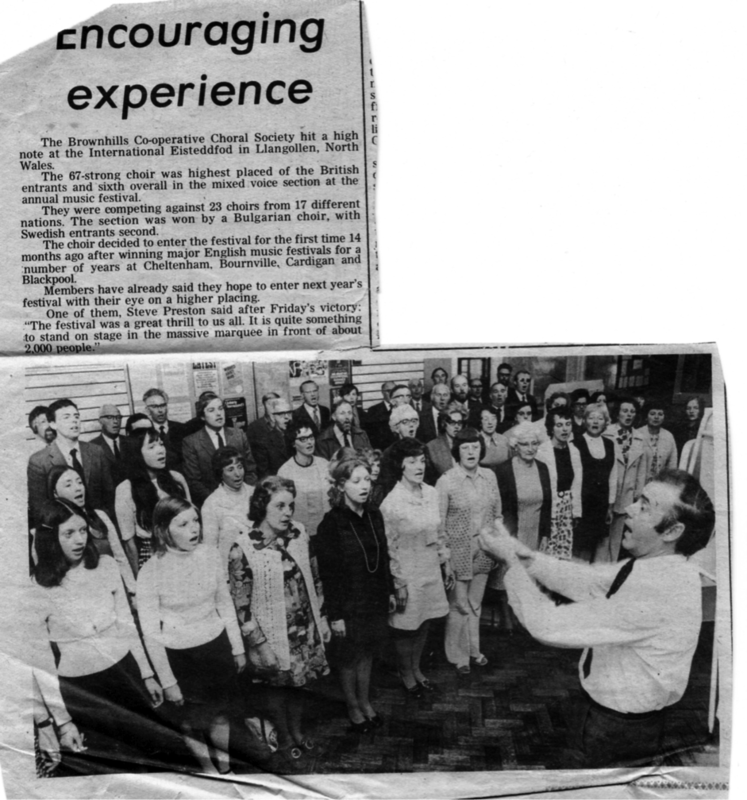 A great late 70s newspaper clipping of Brownhills Choral Society, from the Walsall Observer if I remember the typeset correctly. Image supplied by Ian Pell. 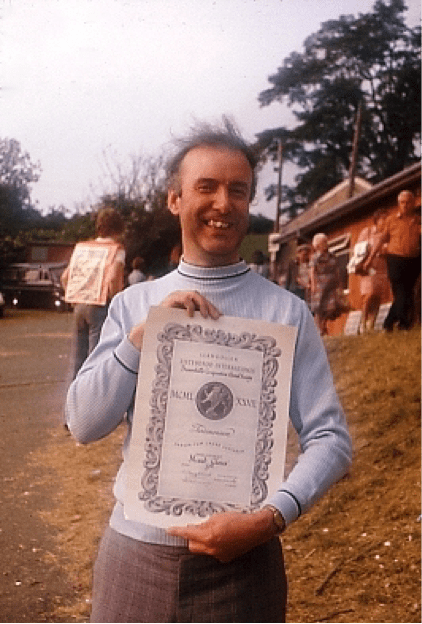 The cutting makes reference to the International Eisteddfod at Llangollen which the society entered on a number of occasions, achieving a 3rd place in 1977 in the mixed choirs section. Deryck was a very proud conductor when he went to collect the scroll from the judge’s tent. I remember that the coach was bedecked with a large Union flag over the front radiator and the bemusement of the coach driver who appeared to him to be driving a load of English people on a non-stop singing tour of North Wales! Deryck and the scroll. Image kindly supplied by Ian Pell. 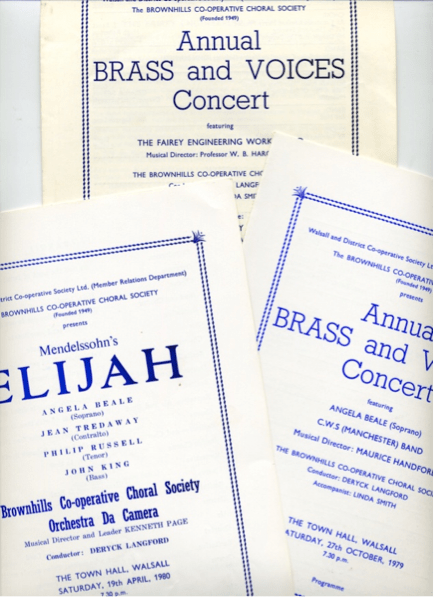 In David Evan’s fine article, ‘Songs to Sing and Voices to Sing them‘, the picture illustrates the Walsall ‘Brass and Voices’ concert of 1979. The brochure is shown below together with some of the other events held by the Society in Walsall Town Hall. It is quite remarkable to think that the town hall was full to overflowing for many of these concerts and could have been filled twice over! Perhaps an over statement, but certainly there were many disappointed people who didn’t get tickets for the events. How times have changed? The Brass Bands were some of the best bands of the music world including Fodens, Fairey, CWS Manchester, Morris Motors to name a few; while among the soloists were sopranos of the calibre of Maryetta Midgley, Cynthia Glover and Tenor Vernon Midgley. There were visits to Pebble Mill (the BBC studios in Birmingham), recording session s in Pelsall and of course the single and the LP. Where was Terry Wogan when he was needed? Ian’s collection of brochures and programs from Choral events. Indeed in 1979 it was reported that ‘a great contender for the pop and disco charts was the Society’s version of the Women’s Institute anthem Jerusalem – lyrics by William Blake’. Believe it or not it was actually taken up by Radio Luxembourg. So you see spin is nothing new! At this point I have to say that like many things of the late 70’s, early 80’s it reflected both the uncertainties and the dramatic changes which were occurring in the country, although, at the time we were just people from all sorts of different backgrounds sharing a common enjoyment of the music we loved to sing. Happy Days. This entry was posted in Brownhills stuff, Churches, Events, Followups, Fun stuff to see and do, Interesting photos, Local History, Local media, Local music, News, Reader enquiries, Shared media, Shared memories, Social Media, Spotted whilst browsing the web, Walsall community, Walsall Council, Walsall Wood stuff and tagged Brownhills, Brownhills Choral Society, Brownhills local history, choir, Choral, co-op, Co-operative, David Evans, George Fullelove, Langford, Local History, Master, New Photos, Plaque, Road, Silver Street Methodist Church, Singer, Staffordshire, Starbuck, Things to do, Walsall Wood. Bookmark the permalink. Brass and Voices Concerts in Walsall Town Hall ? I shall never forget them. You had to be there, to appreciate the wonderful sound of those wonderful brass bands and the soaring voices of The Brownhills Co-operative Choral society, together with the outstanding visiting singers, uniting in melody to a packed Town Hall. My sincere thanks to Ian Pell and David Evans for these great contributions, More to come ? Can’t wait !! Ian mentions Cynthia Glover. and the two Midgleys, brother and sister. co-incidentally, my three favourites. Many of us were still radio aficionado’s in those days, and by studying the Radio Times, were always aware where our favourites could be heard, ‘Friday night is Music night’, ‘Hundred best Tunes’ and other similar programmes. Maryetta and Vernon Midgley were children of Yorkshire-born Walter Midgley, himself a famous tenor, and his wife Gladys, an accomplished pianist, and so had a sound Yorkshire base, giving many concerts at The Spa, in Scarborough. I used to trek up to Scarborough for these concerts, booking my annual holidays to coincide with these concerts, until I got fed up of the travelling and moved to Scarborough permanently. So it will be seen how the Brass and Voices Concerts and Brownhills Cooperative Choral, altered my life. Sadly, all good things come to an end, so they say, and the dwindling audiences at the Spa for this type of music, put an end to these concerts, and Vernon emigrated to New Zealand some years ago. But as Ian says, while they lasted, Happy days ! I was a junior member of the Brownhills Choral Society in the early to mid 1960s. I remember going to competitions at the Simon de Montfort Hall in Leicester, amongst other places. Deryk Langford was indeed a character. Always smiling and jovial, he knew how to get the best from us. He later had his own insurance business in Bradford Place, Walsall and used to live in a large Victorian house in Belvedere Road, Highgate, Walsall. He was also a Justice of the Peace on the Walsall bench. That great recording speaks volumes for the great musical talent of the Midgleys..
Moving a little off our present track, one of our country’s greatest composers was born and lived for quite a while in Alma Street, Lozells, not far from your own former ‘neck of the woods’, He was Albert William Ketelby, and if you listen to his creation, ‘Bells across the meadow’, on youTube you will realise what a depth of musical talent, the West Midlands, with all its grime and industry, could display. Proud to belong to such a community ? You bet !